We were halfway through a unit on insects and spiders for science. We’d finally hit a page in her textbook that didn’t make her recoil. It was also a section that captivated my attention in a new way. You see, I learned something I’d forgotten about ants and bees. Did you know that scientists label them “social” insects? Social insects are those who live and work together. Each individual ant or bee has a role within their colony and each faithfully plays a part in supporting it. Together, they supply food, protection, and shelter for their entire community. Think A Bug’s Life. The bottom line is that these insects can’t survive without each other. I believe God designed us to be the same. Here’s the thing, though. It’s easy to remain in community when life is going well, right? When we feel strong and capable and brave. Yet, when we face loss, struggle, or heartache – when we most likely need each other the most – we often retreat. We become, what I call in my book Braving Sorrow Together, “relational refugees.” Rather than inviting others to walk through our pain with us, we isolate ourselves from relationship. Being part of a community during sorrow, doesn’t mean you need to share everything you are going through with everyone you know. Instead, it is as simple as reaching out to and confiding in one or two trusted individuals. Sometimes, though, we avoid connecting even with those who know us and love us best. 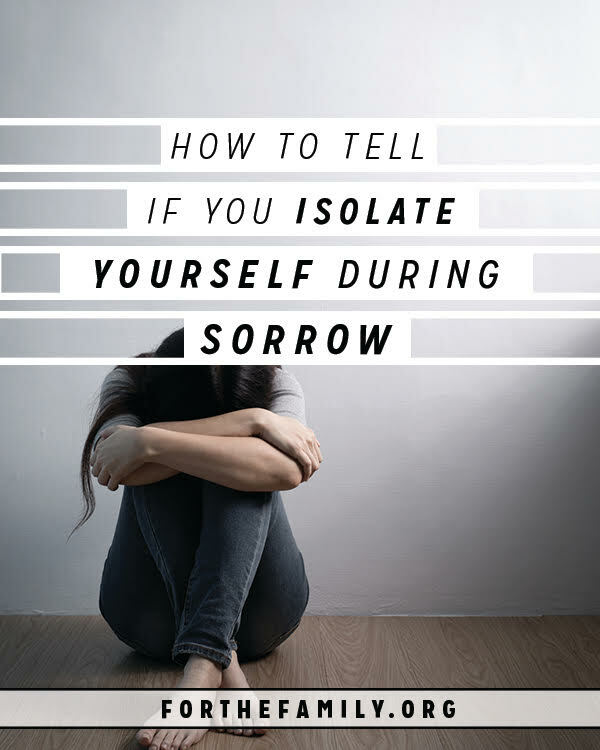 How can you tell if perhaps you’ve allowed sorrow to cause you to isolate yourself? Whether it’s from your spouse, your kids, your friends and family, or your church community, here are three ways. You say to trusted friends, “I’m too busy to get together,” when you actually aren’t. You promise, “I’ll call or text you later,” but then you never do. You tell your spouse, “I’m too tired to talk right now,” to put off conversation. “I’m hanging in there,” even though you seriously feel like you aren’t. “I’m doing okay,” but you are far from okay. These type of statements often close down a potential conversation, rather than allow the asker to support and encourage you in your sorrow. It’s likely that at some point community, or a specific individual within it, has let you down during sorrow. It may even be your spouse who hasn’t been there for you, or who has grieved it differently than you have. If you are choosing to not to participate in community and trust those closest to you because you’re afraid they may let you down again, it could be you’ve become cynical or distrusting. And, if that’s the case, you are most likely isolating yourself when you need others the most. It’s true that community won’t perfectly support us. There will be times they’ll let us down. Even so, let’s choose to be “ant” and “bee” people. Individuals who brave our sorrow by reaching out to others and allowing them to walk alongside us.